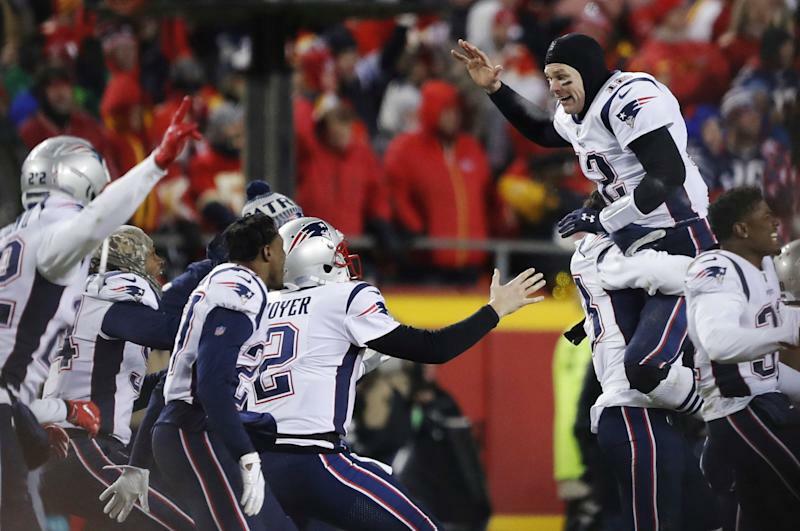 As soon as the New England Patriots beat the Kansas City Chiefs on Sunday in the AFC Championship game to stamp their ticket to Super Bowl 53, prices on secondary ticketing sites fell. And they have kept falling in the days since. Across ticket resale sites, average prices for the game this year, as well as “get-in” prices (the cheapest ticket you can buy) were $500 to $1,000 lower on Wednesday than in recent years at this time, 10 days before the game. This year, prices are already plummeting. On secondary market site TickPick, the get-in price as of Wednesday afternoon was $3,120 compared to the $3,680 at this time last year, and the average price was $5,790 compared to $6,514 at this time last year. TickPick CEO Brett Goldberg says that’s about the fanbase for the Patriots, and the distance for the Rams. Patriots fans, Goldberg said on the Yahoo Finance Sportsbook podcast, “have been to the Super Bowl so many times that they know how this all works... they’re not jumping on buying tickets the day of [the AFC Championship game]. They’re like, ‘I know this, ticket prices are going to go down, we’re going to wait.’” In other words, it isn’t that Patriots fans don’t want to go, it’s that they’ve learned how to time their purchase. 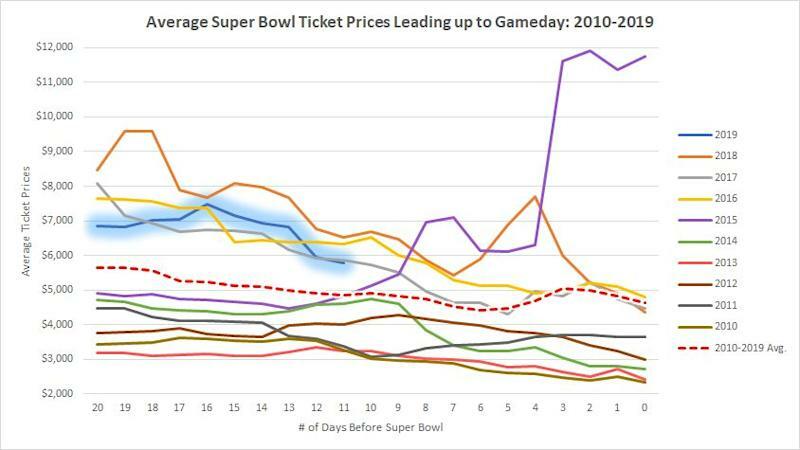 Super Bowl ticket prices on TickPick in the days leading up to the game, since 2010. 2015 (purple) was an anomaly; 2019 data (highlighted blue) is through Jan. 23, 2019. The best matchup for ticket sales, Goldberg says, would have been the Saints and the Chiefs, because Saints fans in New Orleans could drive to the game this year in Atlanta, and Chiefs fans would have made the trip and spent the money because it’s such a thrill that the team has made it. “Given how many times the Patriots have been to the Super Bowl, and probably the lack of demand from Rams fans, this will be one of the least-desired Super Bowl tickets, from the fanbases, since 2014.” In 2014, the Super Bowl was in New Jersey and Seattle Seahawks fans did not want to make the trip cross-country.